I've been looking into the whereabouts of past advertising icons for mental_floss. Nothing had me more mesmerized than these classic Crazy Eddie spots, many of which I found at Must-Be TV. Lots, lots more craziness after the jump. Probably my favorite. "Beat the heat!" should have taken off as a catch phrase. "A Sony Betamax! Or a TV video game!" 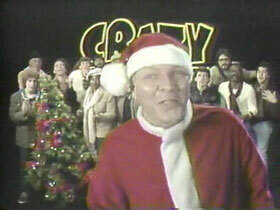 No Northeastern holiday season was complete without Crazy Eddie's Christmas Blowout Blitz! Crazy Eddie pushing records in the early 1980s, courtesy of Retroist. Ever wonder if his merchandise was hot? Crazy Eddie went bankrupt in 1989. Eddie fled to Israel the following year. And he ended up spending seven years in prison. And here's a snippet from a CNBC program earlier this summer. Anyone catch this? To catch up with other advertising icons like Wendy, Mikey and Little Debbie, head over to mental_floss to read the list.